Performance Automatic is pleased to present its new “Blue Chip Street Smart Systems” specifically designed for Ford’s Coyote Crate Engines, the New Ford 572 Big Block, Ford 2.0, 2.3 and 3.5 Eco Boost engines as well as the Ford Modular, FE Engines and Small Blocks. 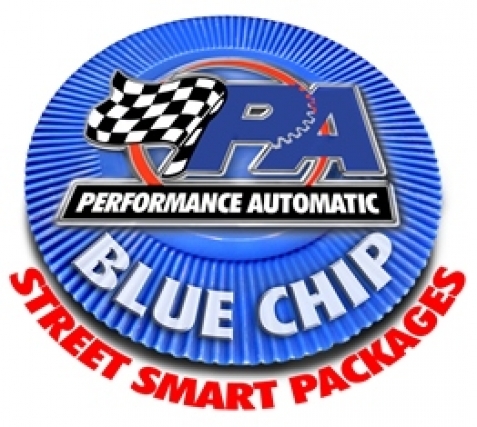 These “Blue Chip Street Smart Systems” include our 4R70W Electronic Overdrive Transmission with many upgrades and internal modifications, custom built engine specific torque converter, updated Smart Shift controller and wiring harness with bump shift/paddle shifter capabilities and full throttle non-torque managed shifts, New Design Bellhousing for the 2.0, 2.3, 3.5, FE and BBF, plus all the hardware and components needed for installation. All of these “Blue Chip Street Smart Systems” are backed by a 3 year warranty. These “Blue Chip Street Smart Systems” come complete and ready for a simple bolt in. All components are matched to your specific engine and guaranteed to perform; beyond expectations.